Since this photo and post were made 7 years ago, so much has changed in this scene inside and outside Steven’s workshop. One major change is that I no longer go to the studio daily, having (mostly) retired. The trees in the field are much larger, the windows have been replaced and the windowsill no longer has this fascinating display. The antler, agate and violin mould are still in the workshop… somewhere. But searching for a post from the past to fit a theme, this came up so I thought it was a perfect one for Saturday nostalgia. Snow is falling again today and as I walked through Steven’s workshop on my way to the studio I thought this window looked interesting. 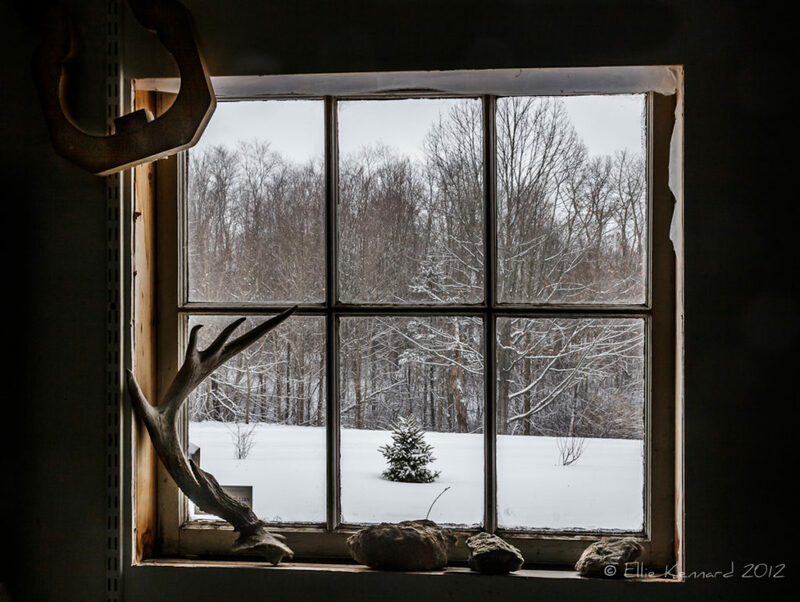 The brave little tree in the snowy field, the deer antler at a rakish angle, those agate filled rocks and the violin former hanging in the corner seemed artistically arranged. Even the remnants of plastic sheet hanging on the window seemed to say so much about the struggle with the elements and the struggles of an artist to create and to survive. Steven will use the antler in his turning work, in case you were wondering, and the stones with agate deposits were picked out of their nearby field and given to us by some children the year we moved to Canada. Agate is the stone of Nova Scotia.